So I just released a new version of “littles3“, a project hosted at Google Code. I tried out the “Issue” feature; pretty neat. But what I really found cool was the “code review” features in the source code management. For instance, the source file that was changed in my latest release was to FileS3ObjectDao. I was able to have a diff from r21 (the old version) and r37 (the new version). It even let me comment right within the diff, in either the old or new version. Version 2.2.0 of “littles3” has been released. This release improves performance of listing keys within a bucket. For instance, 1000 keys with version 2.10 took 3.36 minutes. With version 2.2.0, this same list of 1000 keys took 1.75 seconds. So, I promised some documentation “soon” for littleS3. That was 2 months ago. Well, I have finally made good. I have just published a “Getting Started” wiki page to the project site. So far, this document provides some background on the project components, how to deploy it to an application server, and what the configuration files “configure” (along with sample configuration files in the project download section). I would still like to add some samples of how to use the system to create buckets, add objects, etc. This is very similar to the usage described in the Amazon S3 Developer Guide for the REST API, but there is a bit of a trick since you are using your own application server. In addition to the host name, you may need to include a context path (a servlet notion) to the REST URIs. The token “$resolvedLocalHost$” will be replaced the value of InetAddress.getLocalHost().getCanonicalHostName(). This may be handy if your application server isn’t bound to “localhost“. 1 Game Boy Advance – used, but in very good condition. Only used by adult in home brew software development. 1 Game Boy Advance SP – used, but in very good condition. Only used by adult in home brew software development. 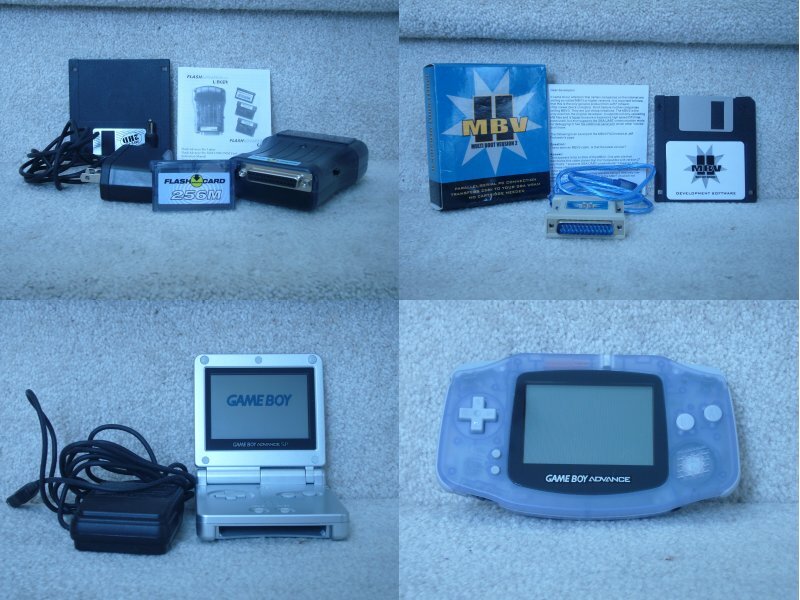 Includes cord for recharging Game Boy and original box. 1 Flash Advance Pro Linker – Includes the actual Flash Advance Pro Linker used to transfer programs to 256M (bit) card (included). The 256M card is used to store home brew software on. The card can then be inserted into the Game Boy Advance or Game Boy Advance SP. The game system will then run the software stored on the cartridge. The Flash Advance Pro Linker is designed to attach to a parallel port. An original floppy disk includes Windows software for transferring files to the cartridge. A power cord for the Flash Advance Pro Linker is also included. 1 MultiBoot Version 2 – Includes the MutltiBoot device for downloading software to Game Boy internal memory. Designed to connect to a Windows parallel port for programming and serial port for debugging. Includes the original floppy disk. I haven’t actually used this hardware for a couple years. But when I was using it, I wanted to create my own programs for the Game Boy Advance. For instance, I created a little program that would display digital pictures on the Game Boy Advance. This system, along with software and information available at sites like http://www.gbadev.org can provide information on how to get started programming for a portable game system. Here is the processCalculatorKeyPress function. 006:  * calculated, it is left unchanged. 009:  * @param precision the decimal precision to round to. Add the “onkeypress” to the text fields that you would to support the build in calculator functionality. You can configure the precision value, from no rounding (use a negative value, like “-1”) to whatever decimal place is important. For currency input, I use a precision of “2”. I have successfully used S3Fox Organizer with the current “littles3” source code. S3Fox Organizer is a Firefox extension which provides a simple interface for managing files with Amazon S3. To get it to work, I needed to control the resolving of “http://s3.amazonaws.com”, which is the URL that S3Fox Organizer is coded to use. I edited my machines “hosts” file, C:\WINDOWS\system32\drivers\etc\hosts on Windows, to have s3.amazonaws.com resolve to 127.0.0.1, localhost. I have “littles3” running within Tomcat. I have it running as the “ROOT” application so that there is no application context. I also have Apache running with mod_jk connecting to Tomcat. This definitely takes advanced skills to get running and “littles3” isn’t complete yet, but this is a good integration test. The current “littles3” source code has ACL support now. It still needs to implement metadata and the ability to “provision” user accounts. But it is at a personally usable state now.